Larissa had a rare and dangerous skin disease. Her mom didn’t even know about it– largely due to the fact that she hadn’t bothered to take her to the doctor in over five years. Larissa couldn’t walk, she was in constant pain, and she had little chance of living. “When she came to the church, we began to disciple her and her mother. We gave her all the medical attention that she needed”, said Dr. Dania, POI Clinic Doctor. 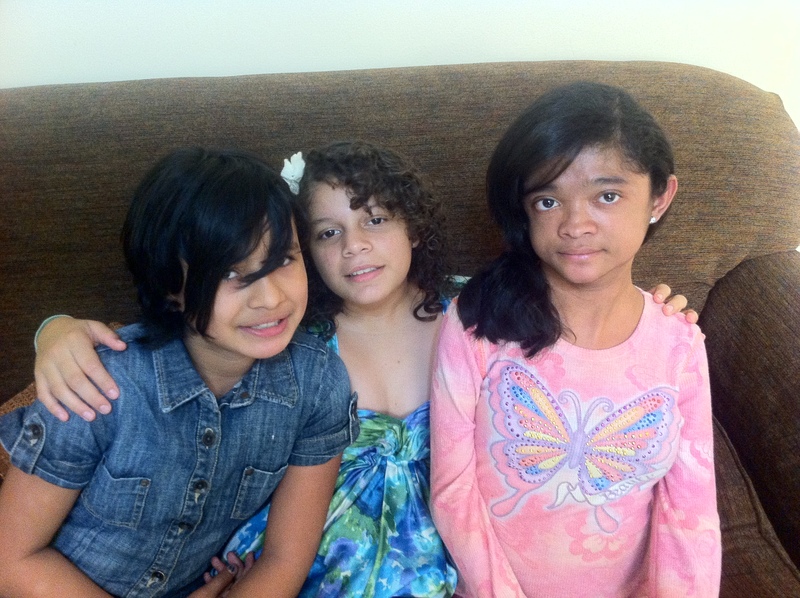 Larissa (right) with Katy and Karen, two of the girls that live in the orphanage with her. Larissa’s mother knew that she could not sufficiently care for her, so she gave Larissa up to the POI girls orphanage. Now Larissa is just a normal girl. She can walk, swim, play, and do whatever average girls do. She loves living at the orphanage with the girls who have become her best friends. Doctor Diana ministers to children much like Larissa each day. She is committed to using her position as the POI doctor as a platform to share the love of Christ as she helps children and families in need. How long have you been the doctor for the POI programs? About how many kids/ adults do you examine or treat each week? Why is medical care an important part of the POI programs? Private medical assistance is very expensive in Honduras. I want to be able to give the people quality attention physically, but also attention spiritually. Through the clinic, I can show the love of Christ and share the gospel with people. General medical checkups or any other emergency or sickness that comes up. I also deal with a lot of mental issues such as depression, which is a huge problem in these communities. Is this medical care available every day the kids are in the POI program? It depends on the child. For children that are malnourished, I see them every month, sometimes more. Other children usually come every other month or whenever they need special attention. There are 2 clinics; one at Crucitas and one at Villa Nueva. The kids in San Juan and Feb 21 are just taken to the nearest one. What is your biggest obstacle in helping these kids and families? Trying to show them the love of God as I meet their physical needs. I want to impact their families through the help that I give to each child. Can you tell us any specific stories about some of the cases you have worked with? A girl, supposedly with a mental problem, came into my clinic one day. I asked her why she had so many bruises on her legs. She hesitated, but told me that her mother had taken her to a place she had never seen before the previous night. When her mother got drunk, she was left to fend for herself. There were lots of men there, and they sexually abused her. I was able to counsel her and treat her. We moved out of her mothers home and into the girls orphanage where she no longer has to worry about being hurt or abused. There was another girl that came to my clinic in Crucitas. Her mother had left her and her father to go to the US. She had fallen deep into depression because of her mother. She told me that she didn’t want to live anymore, that she wanted to kill herself. I was able to develop a relationship with this girl and I am counseling her through this hard time in her life. When I have the opportunity to treat someone in the clinic, it not only impacts them, but it has the potential to impact their family and friends with the gospel of Christ. – Dr. Dania, the POI clinic doctor.